A bouquet of courtship and affection by request. Based in the songs of the old West plus a broad brush of styles ranging from Victorian times to today. A better title for this CD would be Rex and friends for all who joined me in recording this project. It was so great to bring them together in the studio. Rex sings of the American West, from the times of the early explorers, the fur trade, the Civil War and the cattle drive era to the end of the 19th century. From Lewis and Clark to Jack Thorp and Badger Clark he brings to life the music from another time on the instruments from that time. As the proprietor of Time Travel Music, Rex has performed at countless historic sites and museums across the West playing fiddle, banjo, mandolin and other instruments. His music has been featured on television and radio such as CBS Sunday Morning, museums like the Western American Art collection at the Denver Art Museum and the soundtracks of three National Park Service visitor center films. A long-time collaboration with historian, Mark Gardner has produced the CD, "Frontier Favorites: Old-Time Music of the Wild West". They have also created the award winning book/CD, "Jack Thorp's Songs of the Cowboys" published through the Museum of New Mexico Press in Santa Fe. 2008 was the centennial of Thorp's first book. In celebration, Rex and Mark went on a nine city tour throughout New Mexico supported by the New Mexico Humanities Council. This in turn led to their award of Best Musical Tour of the West from True West Magazine for 2009. They continue to celebrate the legacy of Jack Thorp. Rex joined Southern Colorado musicians, Tom Munch and Don Richmond to create the CD, "A Voyage of Such Nature: Acoustic Music in Celebration of the Pike Expedition”. This was a study not only of the music popular in the early 19th century but also the Pike Expedition itself. The CD led to many concerts along Pike's route in 2006 and 2007 culminating with three concerts with the Alpine Symphony Orchestra. Studying how 19th-century man obtained food, shelter and, when possible, entertainment, has been a life-long interest. When he is not performing, or swinging an axe or hammer, Rex works in the Geology and Physics Departments for the Colorado School of Mines. Rex lives with his family in the high, cool, thin air of Conifer, Colorado. The Stuhr Museum, Grand Island, Nebraska. Western History Association Annual Meeting, Colo. Spgs. Cowboy Poetry Gathering, Arvada Center, Arvada, Colo. Captures the heart of the early west this is the real thing! Well done through and through! This gathering of tunes and songs wonderfully captures the heart and many moods of the early west. So enjoyable and well done. If you have an affinity for the early west you won't be disappointed. CD narrative and tune descriptions are complete with historic points and personal notes. A CD that enriches and warms the soul! Treat yourself, git one! I did, and I'm very pleased! 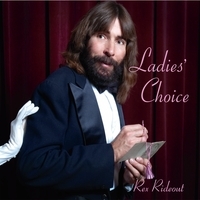 For those who'd like an honest-to-goodness journey back in time, there's Rex Rideout's CD: Ladies Choice! A collection of songs and tunes from yesteryear, this CD gently glides down Memory Lane and brings the listener back to the turn of the 20th Century while maintaining a sense of "now". Accompanying the songs are a variety of instruments from banjeaurine to cello and from tin whistle to uilleann pipes. Of course, guitar, piano, harmonica, and banjo also make their appearance within these Western-style tunes (as one would hope for and expect). The handsome and debonair Rex Rideout is an artist cut from a late 1800's cloth. His soul for America's western days gone by is revealed by his unique tenor vocals that drape you within their velvety embrace. Yeah, this lady chooses Ladies Choice by Rex Rideout to be one of her favorite CD's to enjoy while relaxing by the fireplace with a glass of red wine.